Sorry I cannot provide as much info on these as may be needed for ID but thought I'd try anyway. Both appeared in the lawn in the past week around dawn. 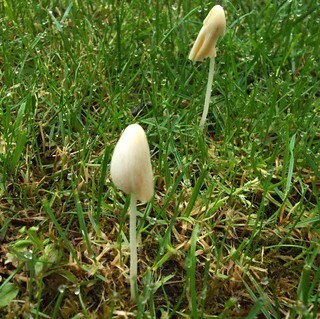 The stem of the first is approx 3cm and the cap is approx 4-5mm across. It has dark grey/black gills. It appears in small clusters. The rim of the cap very quickly curls up soon after it appears and within a short time (minutes) the whole thing disappears. The larger fungi proved equally difficult to pin down as it too disappeared within minutes and I was unable to examine it properly. 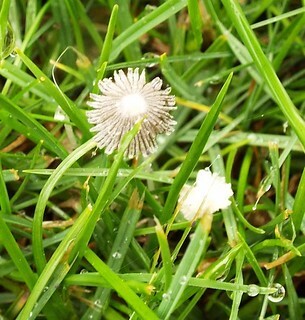 The cap is approx 3-4cm tall. Neither has appeared again but I'm on the lookout for them now so hopefully will have more info at a future date.